“Nobody should be allowed to burn the American flag – if they do, there must be consequences – perhaps loss of citizenship or a year in jail!” then President-elect Trump tweeted in mid-November 2016. Can a person be punished for burning or desecrating the American flag? 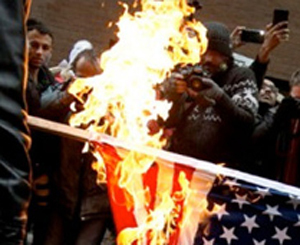 Can a person be punished for burning or desecrating the American flag? If they own the flag, they cannot, according to two Supreme Court decisions. First in a historic 1989 decision, Texas v. Johnson, and then in a follow-up ruling a year later, the U.S. Supreme Court expanded the First Amendment’s protection of free expression to cover the burning and desecration of Old Glory. The first judicial step toward the 1989 Supreme Court decision came in 1974, when the high court said in Spence v. Washington that a person could not be convicted for using tape to put a peace sign on an American flag. The Texas case arose when Gregory Lee Johnson burned a flag in a protest outside the City Hall building in Dallas during the 1984 Republican National Convention there. Police arrested Johnson and convicted him of breaking a Texas state law that essentially prohibited desecration of the flag of the United States. Johnson was sentenced to a year in prison and ordered to pay a $2,000 fine. On appeal, the Texas Court of Criminal Appeals in 1988 stated that Johnson’s speech was symbolic and ruled in his favor. The Supreme Court accepted the case, and in a 5-4 majority ruled in its 1989 decision that flag burning was symbolic speech political in nature and could be expressed even at the affront of those who disagreed. Congress then passed an anti-flag burning law called the Flag Protection Act of 1989, but the court struck that law down as well in 1990.